We’re exploring how growth and development could happen in a meaningful way at the Brentwood Co-op location. If you live, work, play or travel in the area, we want to hear from you. 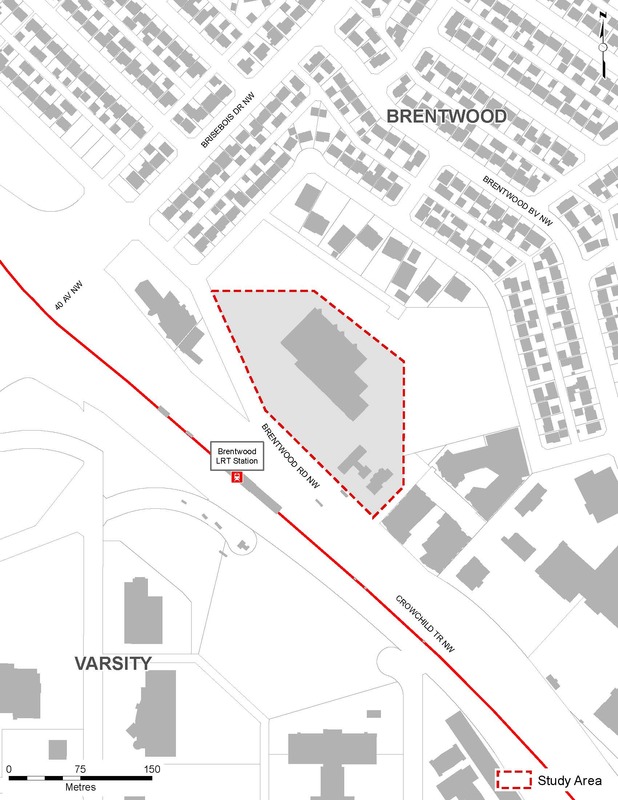 Co-op, in conjunction with Quarry Bay Developments, has proposed a combined development permit and land use redesignation (re-zoning) for the site located at 4122 Brentwood Road N.W. (the existing Co-op site). The development (as of July 2017) proposes four new buildings, along with a relocated gas bar and new Wendy’s with a drive-thru. The tallest building heights are proposed to be approximately 31 storeys (116 metres) and 23 storeys (78 metres). 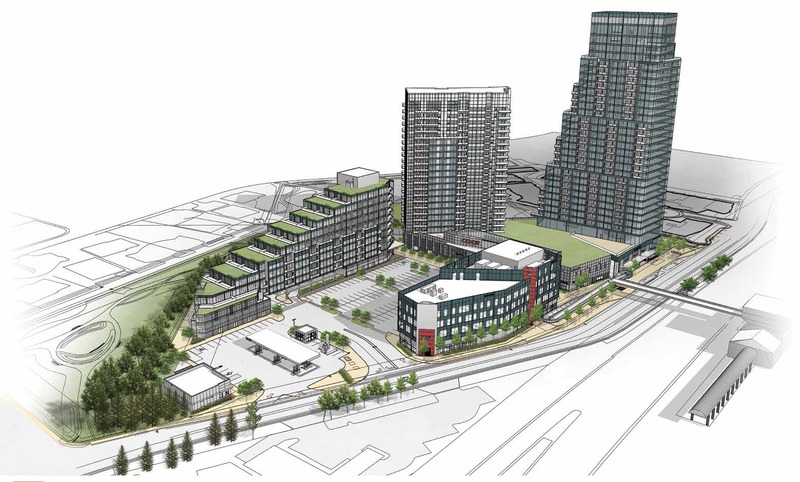 A total of 501 residential units are proposed and 15,500 square metres (166,840 square feet) of commercial space including office, grocery store, retail and other commercial uses and 1,113 parking stalls. The land use amendment application is to redesignate the property from C-COR2 f1. 0 h12 to a Direct Control designation that would be based on the C-COR1 designation. The application number is LOC2016-0328. A concurrent development permit has been submitted with the land use application to redevelop the site. The application number is DP2016-5143. It is the intent of Co-op to develop the site, with these additional uses, including residential units and offices in multiple phases, keeping the current Co-op store and existing businesses open until each of its replacements spaces are built. It is also a requirement of Co-op to keep an adequate level of parking available for customer use during the construction period. Below is an image of the revised development concept submitted in July 2017. Are there any details that can be shared about the residential component, such as what size the units will be? Will this be targeted for students, seniors, familiies or rentals? The residential units generally consist of one, two and three bedroom apartment suites, along with nine townhouse units. 70% of the units have two bedrooms or more. The unit sizes range from 525 square feet to 1725 square feet. The target audiences are young professionals as well as seniors in the area looking to downsize from their larger homes. Based on the numbers provided by the applicant, 613 stalls will be for residents, 48 for residential visitors, and 452 for the various commercial uses (grocery, office, retail). Will there be any upgrades to the pedestrian bridge connecting to the LRT? At this time, no upgrades to the pedestrian bridge are contemplated. How does The City analyze traffic impacts with a development of this size? Will there be any improvements to the road network and infrastructure to handle the increase? Additionally, The City compares the level of congestion and delay against accepted industry standards to determine if any improvements are required to the roadway network. These improvements could include, but are not limited to: a change of signalization, introduction of a new traffic signal, addition of roadway lanes, improvements to transit or bicycling facilities, and restriction/removal of on-street parking. If upgrades are required, these are paid for by the developer. For this site specifically, there is a new traffic signal to be constructed at the west driveway of the development onto Brentwood Drive. There may be additional improvements to the roadway network based on The City's detailed review of the plans. What is the anticipated daily trip count of cars travelling to the site - for commercial and residential? Where has the Wendy's been relocated? The Wendy's has been relocated into building four, which is the four storey building closest to the LRT station. The Wendy's will be on the ground floor with a drive thru located underneath the canopy of the second storey of the proposed building. 90 metres is about 27 residential storeys with a two-storey commercial base (such as the proposed grocery store with a mezzanine). What is Co-op's timeline for construction? The project will take about six years to complete with the new store expected to open around the three year mark. How many retail units will be on the ground level? There are a minimum of eight retail spaces within the development including the relocated Wendy's, a bank, and a new liquor store. More retail units may occur if larger retail areas are split into multiple bays. The new Co-op grocery store is proposed to be approximately 50,000 square feet, while the current store is approximately 44,240 square feet. What is happening to the gas bar, Wendys and bank? Are they closing? Like the grocery store, the bank, Wendys and gas bar are proposed to be relocated within the site, but will not cease operations. Each current business will continue to operate until a replacement is constructed. Yes, the development is proposed to incorporate several phases. The first phase involves the relocation of the Wendys and gas bar. Phase two involves the construction of a new parkade where the existing surface parking lot in front of the Co-op is, as well as a new 4 storey building incorporating a bank, liquor store and offices above, with associated surface parking. Phase three involves the construction of the new Co-op store and parkade beneath. Phase four will involve the demolition of the existing store and construction of two residential buildings above the new grocery store. 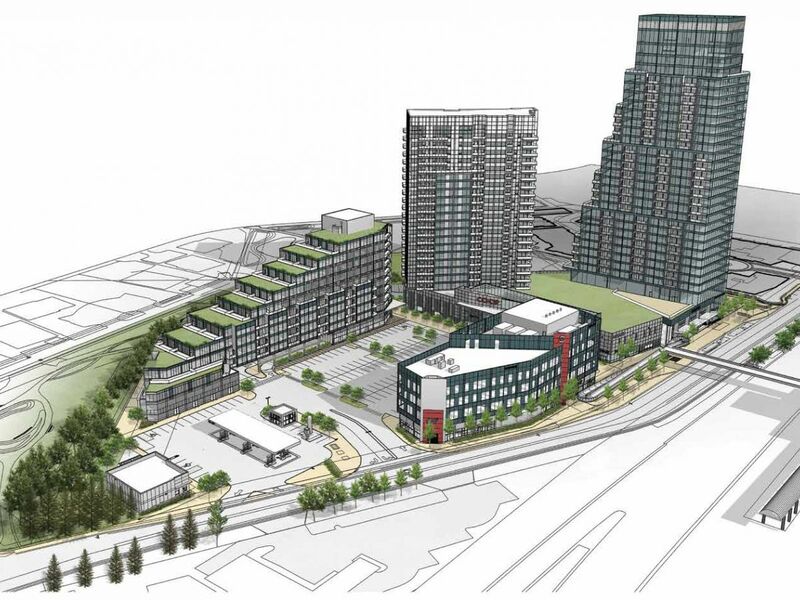 Phase five will involve the construction of the remainder of the underground parkade and the construction of a new residential building where the current Co-op is located. The new buildings incorporate a range of proposed heights. The tallest building is located above the new Co-op (located on the east end of the site, close to University City) and is proposed to have a maximum height of 31 storeys (116 meters). The second tallest building is proposed to be 23 storeys (78 metres) and is also located on the east portion of the site above the new grocery store. The development is proposing a total of 501 residential units. What are the plans to address increased traffic congestion and parking? The required parking enforced through by-law will be provided on-site (both surface and underground). This will address the basic parking requirements for the residential and commercial uses. A Traffic Impact Analysis, which is looking at congestion concerns, is currently under review. The City of Calgary will also work with the developer to identify key locations for improvements based on the Traffic Impact Analysis. We have concluded our engagement for the Brentwood Co-op redevelopment application. Please click through the tabs below to review engagement results. Feedback received in all three phases of engagement has been used to inform both detailed reviews of the submission. The City is currently working with the applicant to negotiate changes to the proposal based on The City's review and feedback from the public. Once Administration has made their decision on the application, we will share the final application and how we came to our decision with the public. In August 2017, citizens were invited to provide feedback on a revised application for the Brentwood Co-Op redevelopment. This feedback was used to inform the second detailed review of the application and was shared with the applicant. In May 2017, citizens were invited to participate in a visioning workshop. At these workshops, citizens completed a group exercise where a game board of the Brentwood site was used, and participants were able to lay down tiles that represented the various uses (grocery store, residential space, parking, gas bar, offices, medical clinics, etc.) to demonstrate what layout they think works best for the site. In April 2017, citizens were invited to provide their feedback online and share their ideas and concerns about the project. This survey was available from April 7 – April 17. The feedback received from the survey was used to inform phase two of engagement and the first detailed review of the submission. A summary of feedback received and verbatim comments received during phase one are included in the What We Heard Report. Application is placed on hold.